[Anglican Communion News Service] Disappearing islands in the south Pacific, recent hurricanes in the Caribbean and food security issues in Africa were amongst the items discussed by Anglican church leaders as they discussed climate change and the environment during the Primates Meeting in Canterbury, England. The discussions began on Oct., 3 when Archbishop John Holder, primate of the West Indies, briefed his colleagues on recent hurricanes in the Caribbean; and continued Oct. 5 when the primates heard about disappearing islands in the south Pacific and food security issues in Africa. Commenting on the primates’ discussions, he said: “We were hearing the stories from different parts of the world on climate change,” he said. “And I think we are all convinced it is a fact of life. Even if you take away the term ‘climate change’, something is going wrong with the weather. The weather is becoming extremely destructive and there must be a reason for that. On Oct. 5, Archbishop of Southern Africa Thabo Makgoba began the morning session with a biblical reflection on John 1: 29. He told ACNS that he finished his reflection with “a challenge, as Jesus invites us – as he said to Peter – to feed his lambs, to feed his sheep. A number of primates spoke about climate change-issues in their region, including Archbishop Albert Chama of Central Africa, who spoke about food security; and Archbishop Winston Halapua, the bishop of Polynesia in the Anglican Church of Aotearoa, New Zealand and Polynesia, who spoke about rising sea levels. 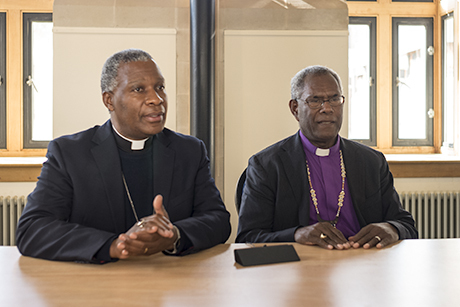 “The design of the Primates Meeting is just so overwhelmingly empowering,” Archbishop George Takeli, the primate of Melanesia, said, “particularly the sessions on reflections on the Scriptures. He said that there were three important issues to consider: “The weather pattern throughout the year is no longer consistent, creating surprise cyclone seasons – we have more cyclones than before causing flash flooding. Some places where there are no floods we are getting flash flooding happening. “Secondly, the climate change is affecting the soil – the whole overall environment where you could plant two or three times before and you could harvest the same amount of food, is no longer there.” He said that many Melanesians live of subsistence farming and can no longer grow crops to feed themselves and their families. Makgoba is recognised as a leading champion of environmental concerns. He too welcomed the discussions. “What I hope will come from this meeting is a commitment by each primate to pray for social justice issues but to look at those with the eyes of saying the climate, the environment, the earth where they are happening, ought to be cared for,” he said. Takeli added: “What strikes me is the awareness, as I listen to many stories from my brother primates throughout the world I see that I am being buried deep in their own issues as well. They become part of me. Who are the primates and what is the Primates Meeting? The President of the United States has rolled back many of the regulations protecting the environment, and so has joined in the battle against those concerned about climate change. He has just appointed a coal industry lobbyist as second in command of the Environmental Protection Agency, with a clear intent of dismantling this crtucial agency. The Church needfs to spreak out against this destructive administration in the name of God. As people of faith we are all called in different ways to love our God and to love our neighbors. I am with you today to discuss energy. What is the connection? After love it is energy that makes the world go ‘round. Everything we do uses energy, and the energy industry has helped to make this country great. Unfortunately, our energy dependence has produced some very serious side effects. Did we love our neighbors when we brought them to this country from Africa as slaves? Do we love our neighbors when our use of electricity seriously impacts the health of the poor who live in the shadow of coal burning power plants? Do we love our neighbors when our consumption of foreign oil contributes significantly to conflict around the world? And do we love our neighbors when our emission of greenhouse gasses changes the very climate on this fragile earth, our island home? The community of faith has always led in the great movements for justice. We led in the abolition of slavery. We led in the movement for women’s rights. We led in the struggle for civil rights, and we continue to lead in the effort to remove the curse of racism from this land. Now it is time for us to respect the dignity of every human being and all life on earth. Let us begin by addressing our consumption of energy. The Intergovernmental Panel on Climate Change has urged the developed nations to reduce their emissions of greenhouse gasses by eight-five percent in order to stabilize the climate at its current state. The leadership of this country, however, has refused to commit itself to any reduction at all. Religious leaders of every faith have reacted by passing resolutions, writing letters to the President, and lobbying Congress for sustainable energy policies, but we need to do more. It is time to practice what we preach and to show forth not only with our lips, but in our lives what we ask our political leadership to do for us. It is time for the community of faith to practice energy conservation, invest in energy efficiency, and thus save more than enough money to afford cleaner sources of energy. Together, we can save energy, save money, save the planet, protect the peace, protect human health, and create jobs too. As we gain strength in the marketplace, we will have a voice as to where the jobs go and who gets them. This is not just a ministry for the environment, but a call to love and justice for all our neighbors across town, around the world and our intergenerational neighbors, our children, for years to come. And for those of you who are Christians, this is not just a call, it is a commandment.